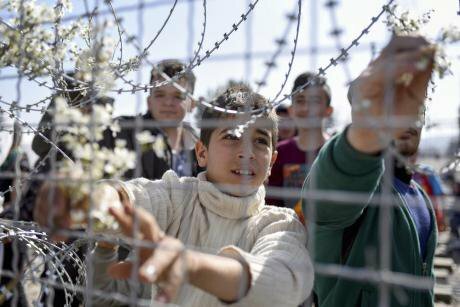 A refugee boy puts a flower on the fence as he waits with others on the Greek side of the border to enter Macedonia, near Gevgelija, Macedonia. Tomislav Georgiev/PA Images. All rights reserved. Phoebe Braithwaite (PB): If you were to let your imagination run away with you, where could we be in say 20 years, the way things with biometrics are going? What would this mean for the most vulnerable members of society, and what for the wealthiest? Christina Rogers (CR): Like so many others, I am stuck with the feeling that biometrics is a matter of ‘inevitability’ rather than choice, although I know that this is just how the introduction of biometrics has been framed by industries and governments. Biometrics are increasingly becoming a ‘normal’ thing to encounter, be it at the airport or when unlocking your phone with your fingerprint. I think we are heading further and further towards a normalisation of biometrics in many different spheres, providing access to objects (e.g. laptops), institutions (such as the university or library), states (at borders) and their respective social systems (for example in accessing welfare). Current developments point to multiple biometric systems, meaning that systems no longer need rely on a single biometric feature, but rather work by capturing several traits from facial scanning to iris and fingerprint recognition. This is expected to enhance the accuracy of authentication systems, because multiple sources of information are used and cross-referenced. Trusted traveler schemes and border controls already show quite clearly what this means for the wealthiest and most vulnerable members of society. Many privileged travelers voluntarily give away their data and enroll in biometric systems pre-departure in order to use special access corridors at the airport and make their transit more smoothly. This means that controls can be heightened by positioning border controls prior to the actual border at airports via ‘green-listing’ people, while, at the same time, giving these ‘bona fide’ travelers the feeling that, for them, the border is absent, as they do not have to experience time-consuming checks by border police or flight personnel. While, in these cases, people volunteer themselves for biometric databases, refugees and migrants increasingly face obligatory capture into biometric systems. Applying for asylum or having access to welfare systems, accessing work or getting residents’ permits mean having to submit to this form of capture. Also, databases containing information on refugees and migrants are more and more being linked together and used for different purposes, turning the databases regulating access to specific spaces and goods into intelligence files. Biometric systems make it much more difficult for certain people to move to and within the EU. Most illegalised migrants in Europe didn’t cross the border by land, but rather travelled to the EU legally on a short-term visa and stayed after it expired. Thus, while visa restrictions and the Dublin regime produce the category of illegalisation as such, the Visa Information System, for example, is a database that helps to detect ‘visa-overstayers’ and deport them to their countries of origin. In other words, the better biometric and other data are stored and circulated throughout Europe, the more easily migrants come to be stuck at borders or concentrated in cities, camps and informal networks. While pieces of the ‘biometric body’ can travel as data, the embodied subject may not. PB: Are biometric passports the main thing to worry about here or should we be concerned about biometrics in every sphere? CR: No, biometric passports are not the main thing to worry about. Making objects machine-readable is one thing, but linking these objects to the ‘machine-readable body’ is another thing entirely. A good example is EasyPASS at the airport: with this system you can scan your e-pass at the border (comprised of a biometric photo and usually also a fingerprint scan) and look into a camera, which will provide a facial scan and perform a one-to-one match. If your facial scan template fits the biometric picture of your passport and your requirements to access a country, you are free to proceed. Biometric systems make it much more difficult for certain people to move to and within the EU. But biometrics are also often used for one-to-many (1-n) matches, where a person, for example, is checked against a whole body of data, allowing access to different goods or spaces, such as to asylum in a country. One problem with biometrics is that the databases go along with a whole system of categorisations and classifications that are attached to the body via biometrics, allowing for mechanisms of ‘social sorting,’ differentiating between the good and the bad or the authorised and unauthorised person. Here, a person’s iris can provide a kind of password for access or denial without a person’s control over that process. Second, although technology is often regarded as ‘free of human flaws or errors’ – and, thus, free of discrimination – research in this field has shown that biometric databases do show forms of structural racism, classism and ageism and so on. For instance, people with certain kinds of bodily features may be enrolled less readily; at other times, only certain kinds of people may be enrolled – the Eurodac database, for instance, is comprised mostly of the data of people of colour. At the same time, databases are susceptible to human errors, because transnational databases are used by many people, opening up space for false inputs and false links between bodies and data. Thirdly, the general problem with biometrics is that the body is instrumentalised in processes of dataveillance and control, often without giving the person sufficient information on where biometric information is stored and circulated and with which consequences, because the databases are not open to democratic insight or judgment. People are embedded in bureaucratic processes they know little about, and the systems themselves – while closed to scrutiny – are regarded as truthful and objective. People are therefore liable to become victims of automated decisions, made by algorithms and administrations, not least because the people using the systems are often themselves unaware of how the systems they administer really operate. This has been a matter of discussion with regards to people working in foreign registration offices. 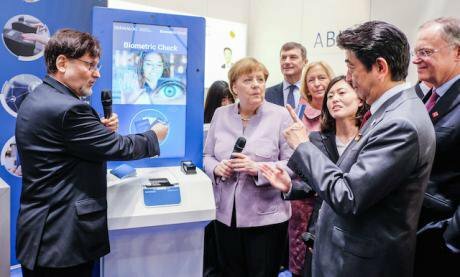 The managing director of Dermalog, Guenther Mull explains a fingerprint-scanner to German Chancellor Angela Merkel and Japanese Prime Minister Shinzo Abe, Lower Saxony's premier Stephan Weil in their biometrics kiosk, which is used amongst other things to register refugees, during their tour of the CeBIT trade fair in Hanover, Germany, March 2017. Ole Spata/Press Association. All rights reserved.We should be concerned about biometrics in every sphere, although biometrics have different consequences for different people. As biometrics are used in ever more spheres of society, there must be a better legal understanding of how this data can be used or accessed. Biometrics are increasingly used as intelligence files, instead of being utilised for only specific measures (which is usually problematised under the heading “function creep”). As fragments of the bodies of people are stored and circulated as templates across time and space, there should be a general interest in how this circulation and storage takes place, by whom and to what ends. PB: What is the longer history of this kind of categorisation and identification, carried within the body? CR: One can draw lines across history to many forerunners of biometrics, including to the custom of potters in ancient China to mark their products with their fingerprints in wax. But I think the most important precedents are developments that took place within the course of the 19th century, where, due to the impact of natural science and Darwin, a general interest in varieties of “life” trickle down into many fields, including medicine, sociology, criminology and theories of racial otherness. Two major strands dominate research in the history of biometrics: the development of fingerprinting in British India initially under the chief administrator William Herschel, and the invention of anthropometry by Alphonse Bertillon in France at the end of the 19th century. Fingerprinting was developed in the colonies, as British administrators were faced with the problem (as they self-proclaimed) of not being able to distinguish one native from the other. With a willingness to identify and control the colonised, British officials developed a system with which to collect and archive inked fingerprints of Indian subjects, who (due to racist ideology) were generally regarded as prone to criminal behavior. Bertillon, on the other hand, developed police anthropometry in France, initially to detect recidivists. His system was very elaborate and included many measurements of the face, arms, fingers, feet, ears, and so on, that were catalogued in a meticulous archiving system, which included photographs of criminals. Anthropometry, or Bertillonage, not only created an archive, but a classification system of ‘deviant’ Europeans with categories such as “prostitutes”, the “mad”, members of the “working classes” and so on. Unlike fingerprinting, anthropometry failed to set an international standard, simply because it was so complicated. The history of biometrics show that this technology is closely related to the construction and detection of the external or internal “other”. It also shows how the colonies functioned as a “laboratory” for techniques of control and classification that were only then used to surveil whole populations in the west. PB: Where are the opportunities for civil disobedience when it comes to something likely to penetrate border policing as deeply as biometric passports? Where are the weak points where pressure can be applied? CR: Well, one can begin on a personal level and simply be a bit Bartleby when it comes to presenting oneself at the gateway to biometric systems: easyPASS and many other border systems at airports still are optional, but many do not feel inclined to avoid them, although they have the right to do so. The same is the case for locking one’s device with biometrics. As long as the majority of people allow the introduction of biometrics into their lives to be such a seamless process; as long as they ask no questions, and show no signs of hesitance or resistance, governments and industries will feel no need to provide explanations, and biometrics will be introduced unrestrained. The colonies functioned as a “laboratory” for techniques of control and classification that were only then used to surveil whole populations in the west. Attention should also be paid to the legal frameworks supporting biometrics. Much critique has been formulated in terms of privacy issues following the observation that legal frameworks concerned with privacy have increasingly been watered down to allow for biometrics to function in the way they do. People working in law have much leverage to pressure biometric systems. It is crucial to highlight the rights people still have or should make use of in terms of these systems. Beyond simple privacy matters, though, people should devote more attention to other legal categories, such as matters of ‘bodily integrity’ or questions concerning people’s choices over their own body parts. Finally, biometrics have been hailed as fairly failsafe in public discourse, but that’s simply not the case: there are many ways to trick these systems. You can create forged irises and fingerprints by replicating biometric traits and fool the system that you are someone else. You can interfere with the scan via a so-called ‘digital spoof’ and make the system believe it has scanned an authenticator which in fact it didn’t, and so on. PB: What kind of struggles do migrants face in the context of biometrics, and how do they circumvent these obstacles at present? CR: Migrants face the struggles of having to take considerable care of their ‘data doubles’ as well as when and where they present themselves to a biometric system. There are many places where they can be scanned into different databases. UNHCR, for example, uses iris scans to control who is eligible for care packages and who can access camps in some countries. Furthermore, the surveillance assemblage of the EU has three major databases regulating the movement of migrants: The Schengen Information System, Eurodac and the Visa Information System. The Dublin regime states that people willing to lodge an asylum claim need to do so in the country they first arrive at. But which country a refugee arrives at can have grave effects on whether they are considered suitable as refugees. Landing in the wrong country can lead to deportation. It can also determine whether they are allowed to become part of an economic system, or have access to the welfare system which in turn determines their chances of not only integrating but surviving. Eurodac is the heart of the Dublin regime and uses a biometric matching system to enforce the Dublin regulations. Biometric systems place the border within the bodies of migrants. The European border is not a geographical line at the outer edges of a territory. The biometric border means that the body is inscribed with the power of the border. The biometric border decides who stays and leaves with the scan of a fingertip. Biometric systems place the border within the bodies of migrants. Migrants therefore often try to avoid the first stage of biometric capture: enrolment. This means that information on where scans into the Eurodac system are performed are shared via social media in order to let people pass in corridors to and through Europe without being enrolled. People also refuse to have their fingerprints taken. Many voices of the refugee movement in Europe have tried to raise awareness about these issues, and demanded that their biometric data be erased so they can move more freely. Refugees and migrants have made considerable demands to access the data gathered on them and to open this systematic data collection up to democratic debate. Freedom of movement and questions of data management have been and should be thought of as one struggle in the field of migration.